Dry mango, Black salt, Mint leaf powder, Coriander powder, Cumin powder, Black pepper, Fennel seed powder, Salt, Bishop’s weed, Asafoetida, Dry ginger, Citric acid. Grind mint leaves, green chillies and sour lime to a paste. Blend the paste with 1 litre of water and salt. Add 2 tbsp of Aachi PaniPuri Masala to it. Chill, strain and serve with filled puris. Mash nicely the boiled potatoes. Add the boiled bengal gram and chopped onions to the mashed paste. 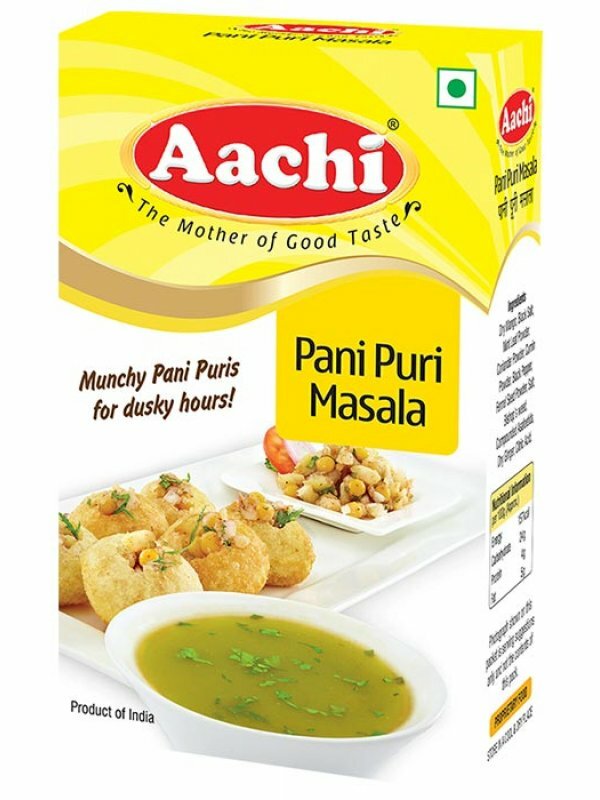 Add 5g (2 teaspoon) of Aachi PaniPuri Masala/ Aachi Chat Masala to the mixed paste. Add a minimal quantity of the paste as filling in the puris. You can also use soaked salted boondi as fillers. For better taste use sweet tamarind and dates chutney.